The Batch Operation utility on the BrightPay startup window enables users to process or perform a task on multiple employer files with a single click. 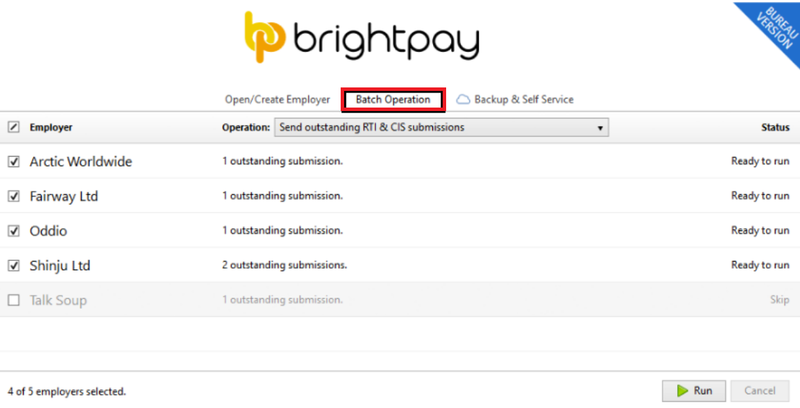 a) To access the batch operation, launch BrightPay and select 'Batch Operation'. BrightPay will list all employer files that have outstanding RTI/CIS submissions. If you do not wish to include any employer(s) in the batch submission, simply de-select them. b) Click "Run" to send the outstanding submissions for all selected employers. Please note: a batch operation cannot be run if any employer files are open.